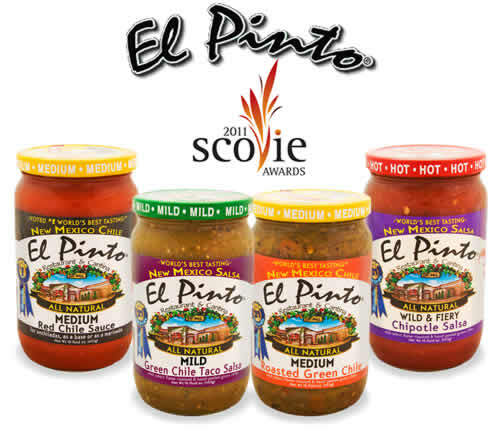 A 4-pack of El Pinto's Scovie 2011 Award winning products. About 800 products from around the world compete for top honors each year during the Scovie Awards in the only of its kind blind tastings from a panel of top culinary experts. the competition for all things spicy and El Pinto won 1st place for our Roasted Green Chile and Green Chile Taco Salsa! We took home second place for our Red Chile Sauce and Wild and Fiery Chipotle. El Pinto knows both red chile and green chile better than anyone and you don't have to love "hot" to love these products. These award winning salsas come in varying heat degrees but the increadable flavor is consistant throughout. Early autumn rituals are captured in the smell and flavor of El Pinto's Roasted Green Chile. Flame-roasted and hand-peeled, El Pinto uniquely preserves the rich chile roasting tradition of Albuquerque's North Valley and makes it easy to enhance any meal. El Pinto's Red Chile Sauce uses hand-picked and sun-dried chiles for the best quality possible. To marinate meat simply add fresh-squeezed lemon or lime juice to our red chile sauce. You can also use this product as a traditional New Mexican enchilada sauce by adding water for desired consistency. El Pinto's new Taco Salsa is fresh with all-natural ingredients, flame-roasted and hand-peeled green chiles with select tomatoes. This original El Pinto recipe is blended down to add a smoother, thicker consistency great for tacos, chips or adding flavor to any recipe that calls for tomatoes. El Pinto's new Smokey Chipotle Salsa is adapted from our original recipe but with an added kick. A new smoked jalapeno flavor that is great for dipping chips, putting on burgers and adding a fresh-roasted flavor to make any meal delicious.